The Waterlase MD is a revolutionary dental tool that uses a combination of laser energy and water without a hand piece ever touching the tooth to perform a variety of dental procedures with fewer shots and less anesthesia. Studies have shown that laser dentistry can be far less traumatic than the drill, especially for young apprehensive patients. This technology allows us to practice minimally invasive dentistry, saving more of the healthy tooth structure. Laser technology also allows us to perform an array of soft tissue procedures with better precision, no use of scalpels, decreased bleeding time and faster healing times. 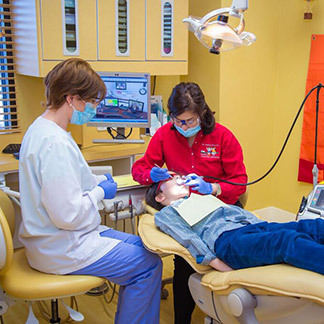 Fewer Visits Required- Since most dental procedures can be performed without anesthetizing the patient, the laser technology allows us to perform more dental procedures in each setting and hence, reduces the number of visits required to complete restorative dental work for your child. To learn more about this revolutionary dental tool, please visit www.bioloase.com or ask our office staff.